Twenty five centuries ago, when savagery was the dominant factor in human societies, a civilized and compassionate declaration was written on clay and issued to the �four corners of the world� that dealt with important issues relevant to the rights of humans, the same issues that not only in those days but even today can inspire those who believe in human dignity and rights. This document, known as �The Declaration of Cyrus the Great,� emphasized on the removal of all racial, national discrimination and slavery, bestowing to the people, freedom to choose their places of residence, faith and religion and giving prominence to the perpetual peace amongst the nations. This Declaration could actually be considered as a present from the Iranian people, expressed through the words of Cyrus, their political leader and the founder of the first empire in the world, to the whole humanity. In 1971, the general assembly of the United Nations recognized it as the first Declaration of Human Rights, thus, registering such an honor to the name of Iran as the cradle of this first historical attempt to establish the recognition of human rights. Unfortunately, today, Iran is considered a country whose people are deprived of the very rights that were discovered, articulated and expressed by themselves. 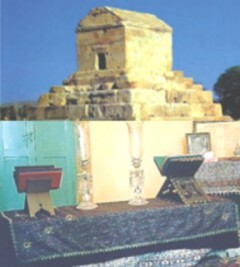 The body that holds the state apparatus in Iran not only does not recognize such �rights,� but has done much (intentional and/or unintentional) harm to the mausoleum of Cyrus the Great in Pasargad plains � the very monument that has been registered by UNESCO as a human heritage and a �shrine,� causing its immanent destruction in the future. 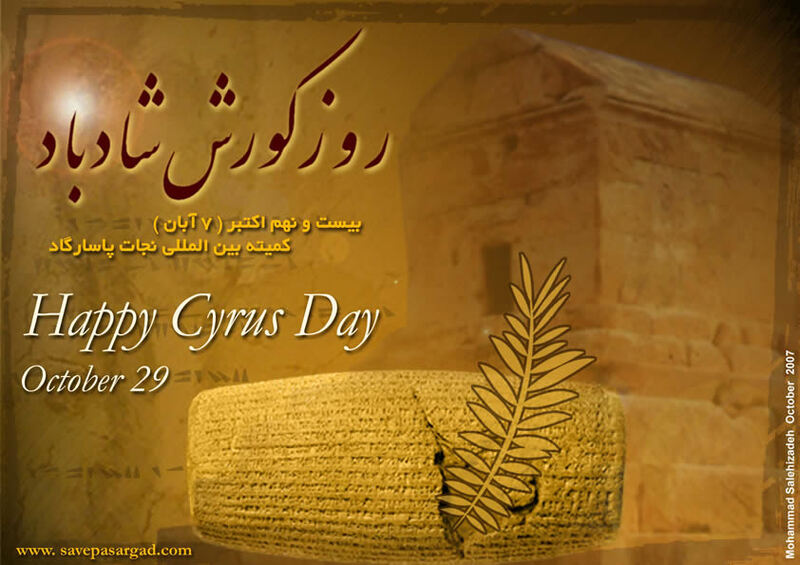 The International Committee to Save Pasargad that was shaped three years ago by a large number of people who appreciate national and world heritages, would like to use the opportunity of Cyrus�s Day to extend its best and warmest greetings for the occasion and repeat its plea to all those who appreciate the importance of Human Rights and its historical symbol in the shape of Cyrus�s mausoleum, to put maximum pressure on United Nations, and especially UNESCO, to use their utmost effective endeavors to save this invaluable treasure of human civilization. Posted: Tue Oct 23, 2007 3:48 am Post subject: What You Can Do? and How? What You Can Do? and How? By Using Your Imagination, Resources, Vision and Talent? 3- If you are a writer please share your thought with public via articles in different languages. If you are great public speaker setup interview with public Radio and Tv Stations �. My Mecca is Persepolis �. My Ashura is Qadissiyah � What Would Kourosh Say? How would Kourosh sleep? How would Kourosh weep? What would Kourosh think of this zoo? What would Kourosh do? 8- If you can afford paying between $80,000.00 to $150,000.00 consider one page Ad in major Newspapers (Wall Street, Washington Post �) regarding October 29, the �Cyrus the Great Day� Greatest Liberator of All Time �. 9- You may consider to invite family and friends to your home to celebrate this great day with them as you wish �. 10- Use your imagination how you wish to remember this great day for your community, friends, family �. Twenty-five hundred years ago Cyrus, a great Persian leader of wisdom and virtue, created the Persian Empire, conquered Babylon, freed forty thousand Jews from captivity, wrote mankind's first human rights charter, and ruled over those he had defeated with respect and benevolence. The Iranians came to regard Cyrus as "The Father," the Babylonians as "The Liberator," and the Jews as "The Anointed of the Lord." The Greeks called him "The Law Giver," and a century after Cyrus's death, an admiring Xenophon of Athens wrote an epic account of Cyrus's many leadership principles at war and at peace. By freshening the voice and style that Xenophon ascribed to Cyrus, Larry Hedrick has fashioned a more intimate Cyrus. A new generation of readers, including executives, managers, and military officers, can now learn from Cyrus's leaderships and wisdom in Xenophon's narrative. روی سخن این نوشته با نوجوانان و جوانان عزیز ایرانی است . که در خارج و داخل ایران عزیز مراحل بلوغ و رشد خود را طی می کنند . ادب و تربیت و صفات وخصایل زیبای انسانی که امروزه نزد بیشتر ممالک پیش رفته دنیا جایگاهی خاص دارد از نظر تاریخی زادگاهی جز ایران و عهد حکومت کوروش کبیر نداشته و او همواره مروج راستی و راستگویی و اخلاق پسندیده بوده است .پس ایرانی بودن یعنی نمونه بودن در صفات اخلاقی و انسانی . وظیفه ما عمل به اخلاق است و حقیقت ما را جهان خواهد پذیرفت . واقعيت آن است که امروز مردم ما، با ملی گرائی بی کورش، و تنها با مصدق، يا هر رهبر سياسی و اجتماعی معاصر ديگر، مردمی سخت فقير خواهند بود. ما امروز، بی آنکه بخواهيم يا بتوانيم چيزی را در تاريخ اسلامی خود منکر شويم، تنها با بازگشت به گذشتهء پيش از اسلام، بازگشت به سعهء صدر کورشی، به کشورگردانی اعجاب آور داريوشی، و بازگشت به آن مهر خورشيد واره ای که در نام يکايک اشکانيان موج می زند، می توانيم سرفرازانه و با غرور روياروی جهان بايستيم. بازشناسی جایگاه کورش بزرگ در تاریخ جهانی يک استثناست. پادشاهان و کشورگشایان در تاریخ فراوان بوده اند و بسیاری در اقتدار و دامنه امپراتوری های خود از کورش درگذشته اند. اینکه از میان همه آنان کورش هخامنشی چنین بزرگ داشته می شود به دستاورد های تمدنی برمی گردد که کورش بزرگ ترین نماینده آن بود. اگر بپذیریم که حقوق بشر یا به زبان دیگر دمکراسی لیبرال از دو جزء حق و آزادی ترکیب شده است آنگاه سهم بزرگ کورش و ایران هخامنشی را در پیشبرد این هردو بهتر خواهیم شناخت. در فضای عمومی فرهنگی ایران هخامنشی ــ زرتشتی که تا اشکانیان کشید، آزادی مذهبی و حق مردمان به داشتن باور های خود و احترام به فرد انسانی ــ اگرچه در چهارچوب یک نظام سیاسی بسته و استبدادی ــ یک گام بلند در حقوق بشر بشمار می رفت. آزادمنشی و رواداری ایرانی دست در دست دمکراسی یونانی همزمان خود پایه های دمکراسی لیبرال را در عرصه عمل و نظر گذاشتند. کورش آزاد منشی و رواداری آن فرهنگ را به قلمرو جنگ و سیاست برد و دو هزار و پانصد سال پیش از بیشتر جهان امروز نیز پیشتر افتاد. او لکه کشتار و تاراج و ویرانی شهر ها و برده ساختن مردمان را برای نخستین بار از جنگ زدود. کورش مسیح نبود ولی نشان داد که جنگ و سیاست نیز می تواند انسانی باشد. نظام نوین آزاد منشانه او با خودش نمرد. ایرانیان هزار سالی آن را در امپراتوری های خود نگهداشتند و به دیگران آموختند. ما در شرمساری این دوران سیاه تاریخ خود حق داریم به روز جهانی کورش ببالیم. از آن مهم تر وظیفه داریم بار دیگر فرزندانی شایسته چنان نیای بزرگی بشویم. A National Day for Iran : Interview with Kurosh Zaim - In Persian This is the 44th program of a series called "In the Realm of Culture" (Dar Pishgaah e Farhang) . Here, Ms. Shokooh Mirzadegi and Dr. Esmail Nooriala (in Denver, Colorado), talk to Mr. Kurosh Zaim (in Tehran), who traveled to Pasargad on Cyrus Day (October 29) together with two bus load of young Iranians to declare that day as Iran's National Day. This suggestion has been welcomed by many Iranians and the International Committee to Save Pasargad has endorsed it. Here, you can get first hand information about the whole story. Cyrus! You have never died, for your spirit is alive within us. Cyrus! We are ashamed before you, for we have many times in the past have let aliens in thought and heart and those without cultural identity to rule your land and to destroy our prominent cultural heritage and identity. We let the ignorant to rule us, so that untruth, deceit and corruption take the place of traditional truthfulness, honesty and brotherhood. And, that the traditional Iranian motto of good thought, good word and good deed be sacrificed in the struggle for survival. We, who were the most loved in the world, became the most hated. We, who were the more advanced in the world of thought, knowledge and technology, became one of the most backward. We, who were one of the strongest, became the most downtrodden; and, we, who were one of the most affluent, became one of the poorest. But, Cyrus! The shame we have brought on you will soon end. We will rid your God-blessed land of the dominance of anti Iranian non-culture. We will again, as you did, remove all religious discrimination so that all religions, sects and beliefs are free and respected all over the country. We will again make your land the cradle of thought, knowledge and technology, so that once again the light of Iranian wisdom shine all over the world. We have gathered here today in order to declare this day of October 29, the National Day of Iran. The National Day of Iran, for on this day, Cyrus the Great, representing the Iranian wisdom and cultural identity, established a world order based on the ever-lasting Iranian wisdom. This was the day on which the first International Bill of Human Rights, 2000 years before Magna Karta of England, 2300 years before the Bill of Rights of France and 2500 years before the United Nations Universal Bill of Human Rights, was issued and brought hope of freedom, brotherhood and happiness to all people the world over. We will celebrate this day of 29th October, every year, and we shall make it an international event as we have done with Nowrooz. Cyrus taught us democracy, and we shall establish democracy in Iran. Cyrus established the first bill of human rights and taught us equality and liberty, and we shall establish the Universal Bill of Human Rights in Iran. Cyrus built the first order for world civilization, and we shall make Iran an indivisible part of the world community. Cyrus established an order based on honesty and justice, and we shall cleanse our land of deceit, corruption and violence. Do not fret the darkness of today, for the future of Iran is bright. And this brightness will soon shine over all Iranians and all over this God's country. We must stay together, so no longer could the aliens and maniacs rule over us and lead us astray from being true Iranians. Cyrus the Great proclaimed more than 2500 years ago: �Today, I announce that everyone is free to choose a religion. People are free to live in all regions and take up a job provided that they never violate other's rights.� Cyrus the Great declared himself not a conqueror, but a liberator and the rightful successor to the crown. Iranians are proud spiritual descendants of King Cyrus the Great, the author of the first charter of human rights. Some of Cyrus� children live in the patch of land called Iran. The overwhelming majority�free humans with human beliefs�live in every country, city, and village of the earth. These world-wide people, one and all, irrespective of nationality, color, or creed are Iranians because they all adhere to the Cyrus Charter; they practice and defend its lofty tenets and transfer this humanity�s precious treasure to the next generation. The ancient world held universal admiration for the beliefs and practices of the Persians as enshrined in the Cyrus Charter of Human Rights. Even the Greeks, the traditional adversaries of the Persians, called Cyrus �The Lawgiver.� History has recorded that Cyrus did accomplish the task for which he was foreordained. Alexander the Great plundered Persia. He destroyed and burned Persepolis, the magnificent palace complex of the Achaemenid kings in the province of Pars. Yet, Alexander paid tribute to Cyrus the Great at his tomb. This shows how much Cyrus the Great was respected, even in the eyes of his fierce enemies. Cyrus the Great was an adherent to the faith of Zoroaster, which was based on the triad of Good Thoughts, Good Speech and Good Deeds and constituted the standard of life for the Persian. Other teachings of the faith of Zoroaster, arguably the most ancient divine religion, have inspired the teachings of other faiths. Cyrus the Great has been given many names: Cyrus the enlightened liberator, Cyrus the benevolent, Cyrus the Law-giver, Cyrus the righteous, Cyrus the heroic conqueror, Cyrus the tolerant King, and many more. No other man so far back in ancient history had been showered with such accolades by kings and emperors who knew of him only by reputation. Cyrus the Great is the founding father of Persia and the mighty Persian Empire� perhaps the most exemplary, magnificent and just king the world has ever seen. An illustration of the benevolent beliefs and practices launched by this unsurpassed historical figure goes back to the landmark action of King Cyrus the Great of Persia. In 539 B.C., having conquered Babylon, the benevolent King Cyrus freed the Jews from captivity and empowered them to return to the Promised Land and build their temple. For his acts of kindness, Cyrus the Great is immortalized in the Bible in several passages and called �the anointed of the Lord.� The Jews, throughout recorded history, looked to Cyrus� people, the Iranians, as their friends and protectors against oppressors such as the Seleucids and the Romans. In the book of Isaiah, Cyrus, the King of Persia, a non-Jew was called the �mash'aka� by God, according to Isaiah when he wrote: �Thus said the Lord to his 'mash'aka (anointed), to Cyrus� (Isaiah 45:1). Jeremiah also told that Cyrus was commissioned by God to go to Jerusalem and build the Second Temple. "Who carry the vessels of the Lord" (v. 11b). Ezra tells the story of the departure of the exiles from Babylonia: "King Cyrus himself brought out the vessels of the house of the LORD that Nebuchadnezzar had carried away from Jerusalem and placed in the house of his gods" (Ezra 1:7). To Cyrus the Great, humanity was one widely dispersed family. He believed in this tenet long before unequivocal genetic findings clearly established that biologically there is only one human race; that the genetic variation within a single troop of chimpanzees, for instance, is greater than that of any two human groupings, no matter how different they may appear physically. What makes people different is not their biology, but the �software� that runs them. People are as good as their software � their beliefs. There is ample proof to support the above assertion. A case in point is the present menace posed by the people whose life is programmed by the software of Islam: an ideology anathema to the Cyrus Charter. But once again, human decency is rising to the challenge, this time in the voice and actions of billions of free people who proclaim: we are also children of Cyrus the Great; we meet any challenge and pay any price to defeat tyranny; and we will not rest until humanity is completely free of the despotic rule of Islamofascism. - Song called "Katibeh" Lyrics by Ms. Shokooh Mirzadegi Lead vocals and narration by Peyman Montazemi Composed, orchestrated and performed by Peyman Montazemi Arranged by Mehdi Montazemi and Peyman Montazemi Recorded. - Paintings From Salehzadeh and others ..